It is Christmastime again and everyone is lighting their home like a carnival sideshow. I try to look for the meaning. I know that we are supposed to be celebrating the arrival of the Christ Child. My eyes tell me a different story. It appears that in our society, the entire celebration has gotten completely pagan with its Pantheon of holiday characters. The whole Santa legend along with the alternative Kwanzaa and Chanukah bit is quite confusing. Mainly it appears to be a commercial bonanza for merchants and an expensive ordeal for parents, where all are mostly concerned with living up to immature and unrealistic expectations of children. I am grateful for the happiness of the youngsters, and confused by the behavior of the adults. It is an inappropriate time of year to celebrate the arrival of Jesus. This is clearly not the time of year that Christ was born. There is a verse in the Bible stating the lambs were in the fields as the three wise men traveled to Bethlehem. Probably the spring, about when the circus hits the road every year. 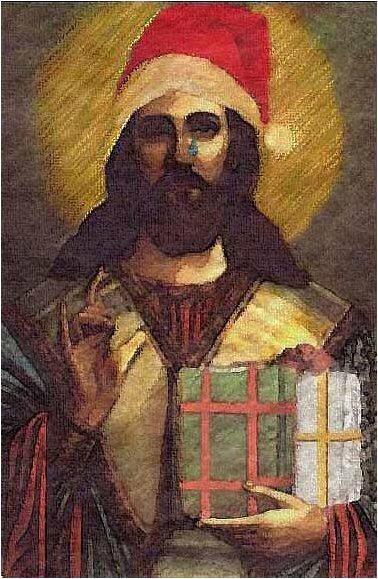 The Son of God had His birthday rescheduled by some Roman SOB. This winter celebration which we call Xmas, with the feast and gift exchange, goes back to before the time of Christ. At some later point in history, an early Pope of Rome, to satisfy the populace, allowed the pagans to keep their feasts and orgies. But he renamed them as Christian Holy Days. This compromise went along with bread and the circus. The emerging Christian religion, and all its clerics, were given recognition, and as the old guard was unaffected; he slid the bill through the senate. We’re still stuck with it. My four-year old daughter asked me what I want for Christmas. My stock answer for years; “fame & fortune”. She asked, “Why do you want that?” I had to think. I guess its insanity. I mean you have got to be nuts to want to be famous. I’ve never seen any good come from fame. Everyone famous gives up his or her privacy. Some give up a lot more. Masses of people came to see the wonders. From what I can learn by reading the press of the era, it was quite a production. It was the longest running sideshow of all time. He made a pitch that got an awful lot of attention and had a very high closing ratio. He performed miraculous stunts. He healed the freaks. His concessions dept. served food and drink to the spectators with the lowest stock bill in history, a few fishes and loaves. He closed with piercing and suspensions. His last performance was an escape act with a huge boulder and a cave. He put on a show so spectacular, that great numbers of fans still attend lectures just to hear about the show. Now that’s fame. What an act to try to follow!